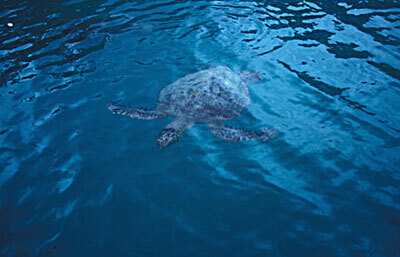 Marine turtles are found primarily in tropical waters. During my travels I encountered marine turtles while diving in the Atlantic Ocean on the Caribbean coral reefs and in the Pacific Ocean while diving in Galapagos and Australia. When visiting Australia's Great Barrier Reef I stayed for a week on Heron Island where my family and I watched female green marine turtles nesting every night. More recently I was involved with the recovery and rehabilitation of an off-coarse, cold, hungry, and very tired marine turtle who strayed into Santa Barbara, California. This lesson uses my pictures of live marine turtles from my travels as well as pictures of a couple of turtle specimens found in the SBCC Biological Sciences museum.